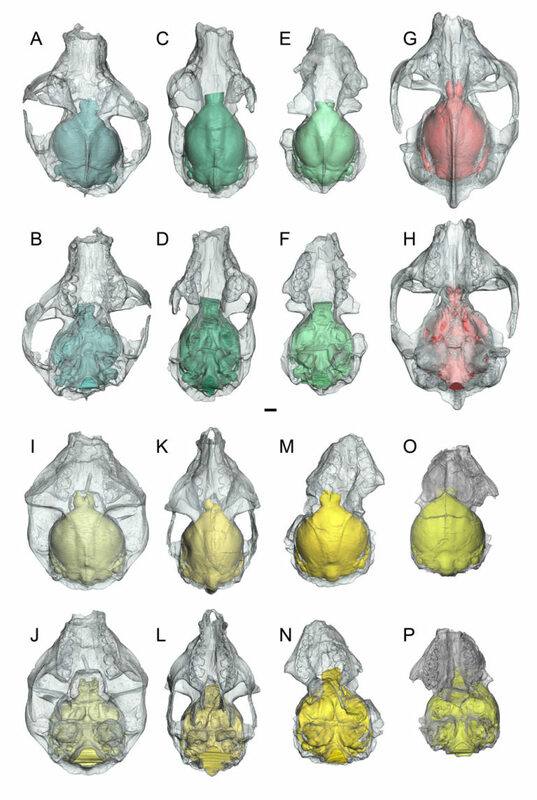 Virtual brains reconstructed from ancient, kiwi-sized primate skulls could help resolve one of the most intriguing evolutionary mysteries: how modern primates developed such large brains. Paleontologists found clues in the remarkably preserved skulls of adapiforms, lemur-like primates that scurried around the tropical forests of Wyoming about 50 million years ago. Thought to be a link between primitive and advanced primates, their fossil skulls are the best evidence available for understanding the neuroanatomy of the earliest ancestors of modern primates. But there was just one problem—the brain cavities of the fragile skulls contained only rock and dust. That is, until scientists used CT technology to create the first virtual 3D brain casts of the early primates. The eight virtually reconstructed and dissected brains—the most ever created for a single study—show an evolutionary burst including improved vision and more complex neurological function came before the brain size boost. Did cooking gave humans the biggest primate brain? Scientists have long debated whether primates have always had big brains compared to body size, or if the trait appeared later. The new study’s findings, published in the Journal of Human Evolution, are consistent with previous endocast studies of Australopithecus afarensis, the oldest hominid known, and Victoriapithecus macinnesi, an early Old World monkey, which showed brain size increase followed brain specialization in early hominids and monkeys. Adapiforms, which are not directly related to humans, evolved after the earliest primate ancestors, called plesiadapiforms, which lived about 65 million years ago. The scientists created virtual endocasts for three different species of adapiforms: Notharctus tenebrosus and Smilodectes gracilis from the middle Eocene Bridger formation of Wyoming and a late Eocene European specimen named Adapis parisiensis. Adapiforms’ skulls differ from the earlier plesiadapiforms in a few ways including having more forward-facing eyes. The new virtual endocasts allowed scientists to take a closer look at anatomical features which revealed that, while adapiforms placed relatively less emphasis on smell more similar to modern primate brains, the relative brain size was not so different from that of plesiadapiforms, says study coauthor Jonathan Bloch, curator of vertebrate paleontology at the Florida Museum. Modern primates are specialized in the visual sense. One of the main differences between the early plesiadapiforms and adapiforms is the region of the brain responsible for the sense of smell, the olfactory bulb, is smaller, while there appears to be an expansion in the area of the brains responsible for vision, Harrington says.